James Rolph grew up in the Mission District of San Francisco. He attended the local parochial school, Trinity Academy. He was a young entrepreneur, only fifteen years old when he started raising and selling pigeon meat. After graduating from high school, Rolph worked as an office boy for DeWitt, Kittle and Company, a shipping firm. In 1898, Rolph and George Hind opened a shipping business, Hind Rolph Shipping Company, which was very successful. In 1928, he became a partner in a new business venture–James Rolph Jr., Landis, and Ellis, a general insurance firm. Rolph entered politics in 1911 when he was elected the mayor of San Francisco. He served as the city’s mayor for 20 years. 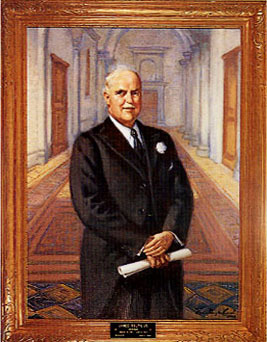 On November 4, 1930, he was elected Governor of California, and on January 6, 1931, he was sworn into office. Rolph was criticized for many things, including signing legislation that caused taxes to fall unfairly on the poor, endorsing a brutal jailbreak lynching in San Jose, and openly ignoring prohibition laws. During his term as governor, Rolph instituted the California Sales Tax, then known as "Pennies for Jimmy." Rolph collapsed at the end of February, 1934. He was rushed to the hospital where he remained for several weeks. After he collapsed a second time in on May 3, Governor Rolph went to the Linfort Ranch in Santa Clara County, where he died on June 2, 1934. Use the California State Library’s interactive tool to view Executive Orders and Proclamations signed by Governor Rolph.